DW Rose Building and Roofing in Hall Green are a Quick Find approved and vetted local business; specialising in all aspects of roofing, building and maintenance in Solihull, Shirley, Olton, Harborne, Edgbaston, Quinton, Monkspath, Moseley, Wythall and surrounding areas. "Excellent set of fences installed with concrete posts . Reliable and completed all work to a high standard . 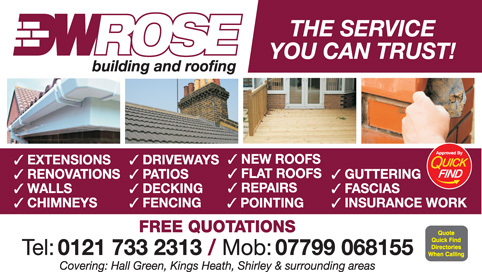 I would definitely recommend this company"
"DW Rose have just completed a replacement flat roof on our utility area and stripped and refelted the roof on our garage/workshop. We are very satisfied with the finished product which is of good quality,and the workmen were very professional and had a very good friendly manner. I would not hesitate recommending this company." "We appointed Darren and his team to build a new wall and pave an area at the front of our house. They were great to work with with throughout and the team were punctual and friendly. I would recommend D W Rose without any hesitation." "Darren and the company have recently completed a 3 meter pitched roof extension, new utility room and down stairs toilet for me. The work and service has been excellent, they arrived promptly every day, the team were friendly and up front about everything that needed doing. The plan and schedule for the build was clearly set out early on, and Darren was very good at managing changes and feeding this in when issues arose due to requirements from the council. As well as a great service from DWRose, I also received great service from Darren's other contacts such as the kitchen fitter, flooring fitter and electricians, all delivered a good quality finish and I would recommend them to anyone." "Since moving in 15 months ago, we have used several tradesmen from your directory. All have given very good service. Recently we used D W Rose Builders and Roofers. Very good service and competitive." "He gave us an excellent Service and was very competitive on his prices"
"I had Darren and his crew to do some ground work and erect a new fence. The work carried out was very good and the workmen were very friendly and helpful. They cleared all the debris and came back to rectify the snagging for me. Thank you Darren for all your help." "I engaged Darren and his team to re-render and re-point the front of ourhouse, as well as reconfigure some internal stud walls and replace a skylight. They arrived on time and their work was of an excellent standard. In additional they were also able to recommend additional trades to complete some flooring and painting that needed doing. They came back to fix a couple of snags without any challenges and I would definitely recommend and use again for future building work."